Innespace Productions has created just the boat for you - if you think that it will take too long to be reincarnated as a dolphin. 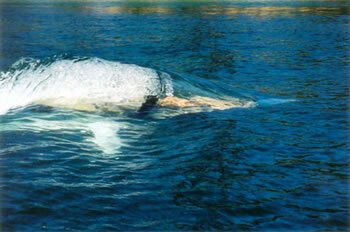 The Innespace Dolphin can do 30 mph on the surface and 20 mph below. This Innespace production is based on the homebrew VASH Bionic Dolphin (VASH - (Variable Attitude Submersible Hydrofoil) created by Tom Rowe and Dennis Kaiser. The body of the boat includes fiberglass and Kevlar. The cockpit canopy is half-inch thick acrylic and polycarbonate, taken from an F-15 fighter jet. 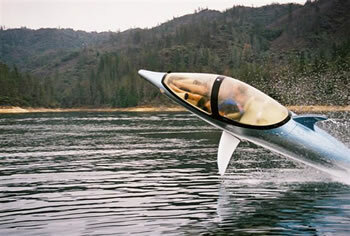 The company will demonstrate a larger, two-seater model - the Sea Breacher - in 2007. The single-seat model will remain a prototype, but the company may introduce the two-seater as a product. The single-seater uses a 110-hp Yamaha Waverunner engine; the vessel itself is 14.5 feet long and about 3 feet wide at the cockpit. It's "wingspan" is almost 7 feet. A small self-propelled ocean glider. The SubjuGator is an autonomous underwater vehicle created by students at the University of Florida; it's based on the design of the Flying Sub from the famous sixties television show. The Cormorant submarine and sea launched plane concept may remind you of science fiction glories past. Update 02-Jan-2017: Check out the Search for the Silver Whale, or Under the Ocean in the Electric Dolphin (1902). End update.